It is a very interesting proposition. The Book of Proverbs, she correctly pointed out, indicates “the two ways that we can go and since we, as a society, are on the wide-open road to destruction and traveling full speed ahead, we had better start educating ourselves and our children on the basics” found in this inspirational book. Her point is well taken. We have lost those basic treasures of wisdom found in the proverbs that were once transmitted by parents to their children over generations. We have lost the clear-cut notions of right and wrong contained in those simple phrases. 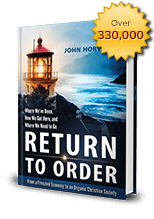 A return to order is a return to wisdom especially as found in this Old Testament book. One interesting citation that applies to Return to Order is that of Proverbs 1: 18-19: “And they themselves lie in wait for their own blood, and practice deceits against their own souls. So the ways of every covetousman destroy the souls of the possessors.” This reckless and restless spirit of covetousness calls to mind Return to Order’s reference to what the book calls the frenetic intemperance of modern economy and society. So many of the concepts in Return to Order are reflected in the Book of Proverbs which is loaded with positive advice that emphasizes the human element that has been taken out of modern economy. The divinely-inspired book is full of counsel about building relationships of trust and confidence that make not only for virtuous living but for sound economy. “I would recommend that everyone who wants to “Return to Order” should start reading, living, teaching and promoting the book of Proverbs,” writes this kind lady. And I would agree since everything in Return to Order is based upon the teachings of the Church and completely compatible with Biblical teaching. Return to Order is an application of such wisdom to our modern day crisis. It presents real solutions based on timeless principles. This entry was posted in Featured and tagged beautiful, brutal pace of life, Catholic Church, false happiness, Family, frenetic intemperance, honor, Institutions, marvelous, Natural Law, Nobility of purpose, Order, organic Christian society, tradition by John Horvat II. Bookmark the permalink.